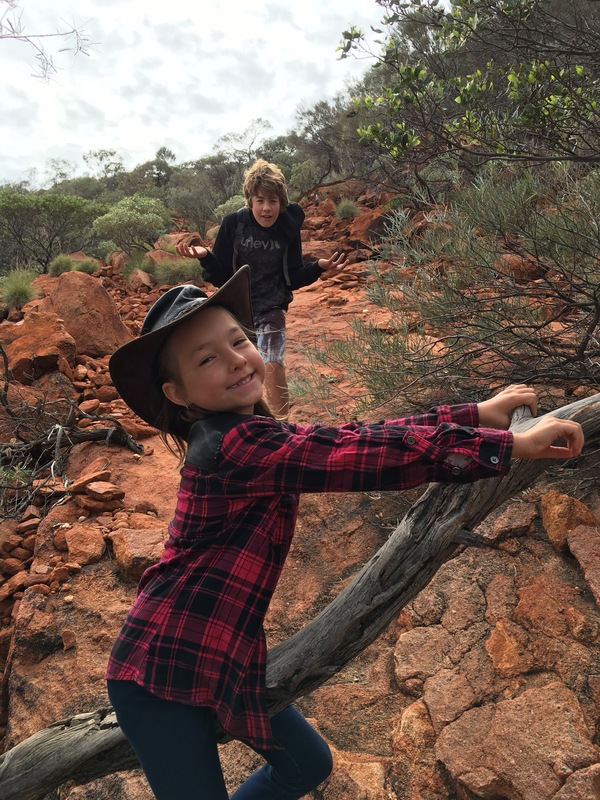 It was a regretful pack up at Quobba – I even asked the kids if they were sure about going to Mt. Augustus. We were all pretty determined to get to Mt. Augustus though so after a quick drive through the sea shanty town at the end of the road, we bid farewell to new-found friends, took one last stop and look at the blowholes (and a glimpse at some sharks making their way through a whale carcuss just offshore) and hit the road for a fairly long drive ahead. We stopped just out of Carnarvon to fill up our tanks and I called the tourist park at Mt. Augustus just to confirm they had fuel there – I didn’t want to get stranded in the middle of WA without enough full jerry cans on board. We left Carnarvon at 11am and got ourselves to Mt. Augustus by 4.45 with only a quick stop at Gascoyne Junction where thankfully, they had a lovely fuel stop. It adjoined a very pretty (and new) looking caravan park and pub with pool and if we had more time up our sleeves, this could easily be an overnight pitstop on the way out to Mt. Augustus. I was pretty exhausted after that much driving so while dinner simmered under the supervision of Master14, Miss6 and I headed to the communal fire with a cold beer to join the grey nomads. One of them had a large packet of sparklers that he gave the kids and Master14 came out to join in some juvenile fun for a bit before dinner. We tried for an early night after dinner, 1. because I was tired from the day’s drive and 2. because we had a long day of hiking ahead of us the next day. One of the nomads around the fire told us that his fit firefighter mate took eight hours to do the walk so I was exhausting just thinking about our day ahead. It wasn’t going to be the hot 29 degrees that it was yesterday so we didn’t register and leave for our hike until 8am. From where we camped we had a great view of Mt. Augustus (it was hard not to view, it was so bloody huge) and the entire top of the mountain was hidden in a thick grey cloud so we started thinking that it may not be the fine and sunny 22 degrees we were expecting for our hike. We had to take about a 15km drive to the summit hike, right along the side of the mountain as we went. Mt. Augustus is known as the world’s largest rock – more than twice the size of Uluru it is an Inselberg (Island Mountain) in the middle of nowhere. 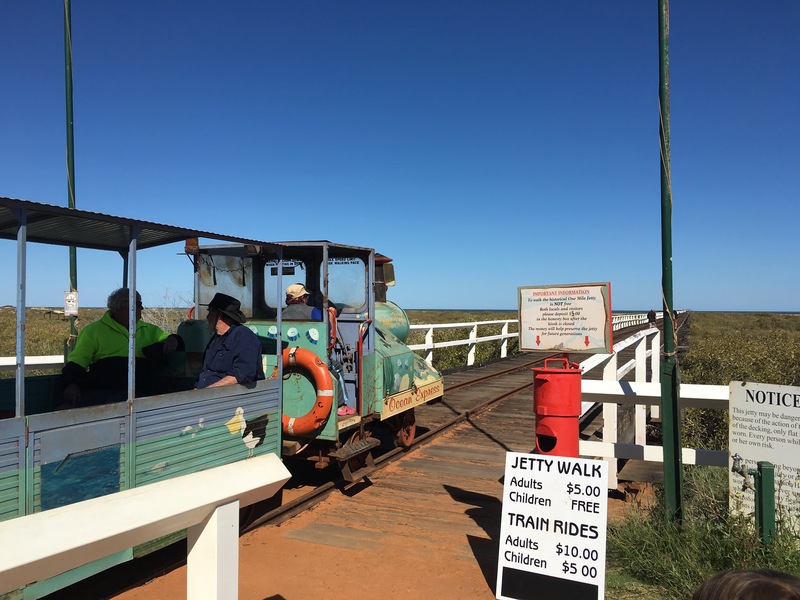 I don’t know why I’d never heard of this place before and only found out about it by accident from a ‘top ten wonders of WA’ website – I think the NT must have the better marketing of their rock, unless WA don’t want many people heading to theirs? We had plenty of water on us incase it did warm up, along with some fruit and lunch for what we expected to be an eight hour day of hiking. The walk was a 12km Class 4 walk up and around the side of the giant rock mountain over uneven and loose ground but the track that was marked took you up in a steady incline for most of the way. The first 1.5km was fairly easy and when we got to the marker and sign that separated the Class4 from the Class5 hikes, we dropped one of our bottles of water there for the return hike down. The next 1.5km were a little more difficult, I found myself puffing a few times and looking up at just how steep we were ascending as some areas seemed almost vertical. The kids were doing a great job and even Miss6 was keeping pace and not needing much in the way of rest stops (stops to take selfies on the rocks was a whole other thing though). Another drink and fruit drop at the halfway mark and a five minute break in the shade to catch our breath. The next 2.7km was much like the first 1.5km and was a bit of a reprieve from the last section we’d just completed. We’d thought that the hike was going to be a fairly lonely one but as we made our way through this section of the walk, we bumped into an older couple on their way back down. 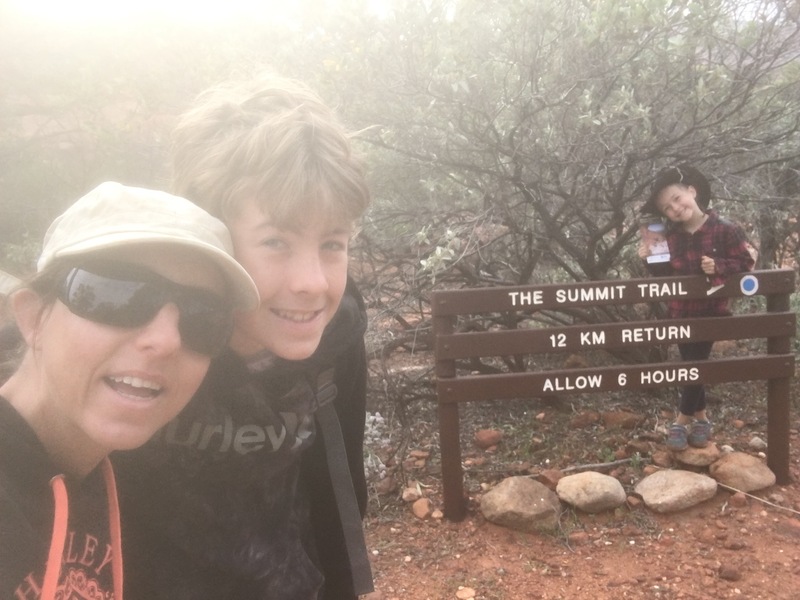 They had a watch that could tell us that we had 1.48km left of our ascent – since I’d lost my Fitbit in the Bungle Bungles I couldn’t even tally how many steps I was racking up on this hike, let alone how far we’d already made it. The final 300m were the toughest, an almost vertical ascent up some large rock surfaces before we finally made it to the top. What a view! We were officially 1,105mtrs above sea level and I could not be more proud of the kids effort to get here. 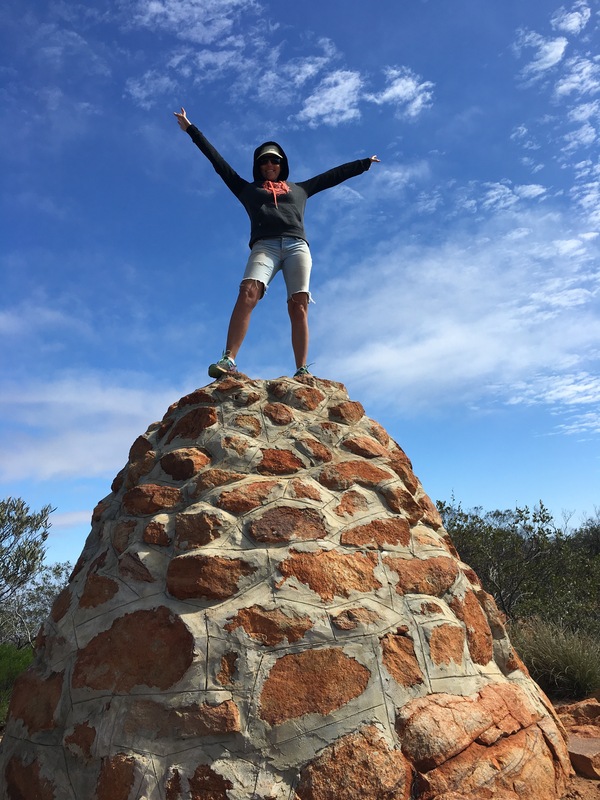 There was a cairn at the top built of large rocks and concreted together that you could stand on top of and admire the 360 degree views – while trying not to get blown off the top by the wind. A local had, over several trips to the top (both by himself and by convincing other hikers to help) constructed a large picnic table to sit on at the top and enjoy our lunch. We had some random service while we were up there so the kids called their dad to proudly tell him they were on top of the world. The register of climbers that we happily signed showed years and hundreds of hikers that had gone before us. 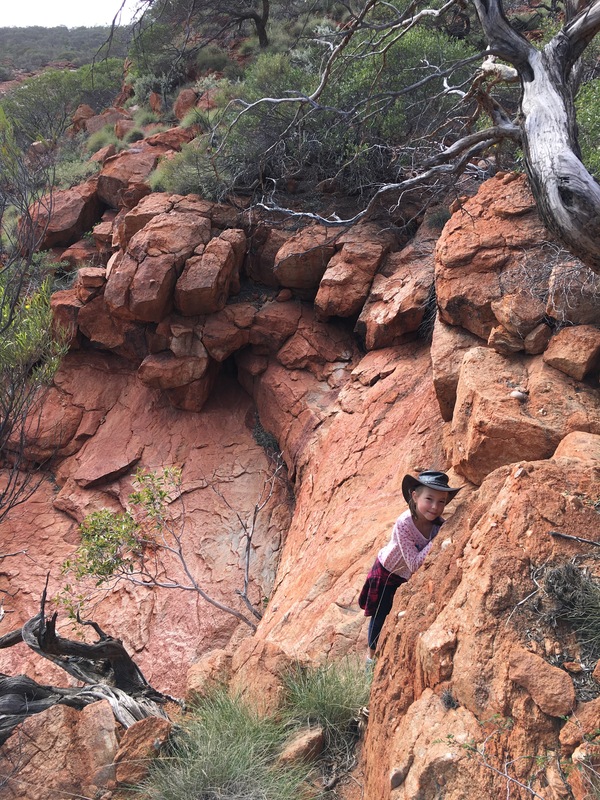 We looked through to see the ages of some of the hikers as the lady at the tourist park thought that Miss6 might be one of the youngest to make the climb. We did see a 20month old but figured that didn’t count as they would’ve been piggy-backed. The youngest hiker we could find was another 6 year old boy – this still made Miss6 pretty proud and after just under three hours to get up there and an hour stop for lunch, she was ready to finish the hike with the descent. Master14 wanted to speed ahead of us on the way down so Miss6 and I spent most of the hike together singing and playing her make believe games on the way down. I’m glad we made the fruit and water drops on the way up – they came in handy on the way down despite it not being that hot we were drinking a fair bit and it saved me carrying it all the way up the mountain. We managed to get back in around 2.5 hours and back in the car with no injuries and feeling pretty good about our achievement. 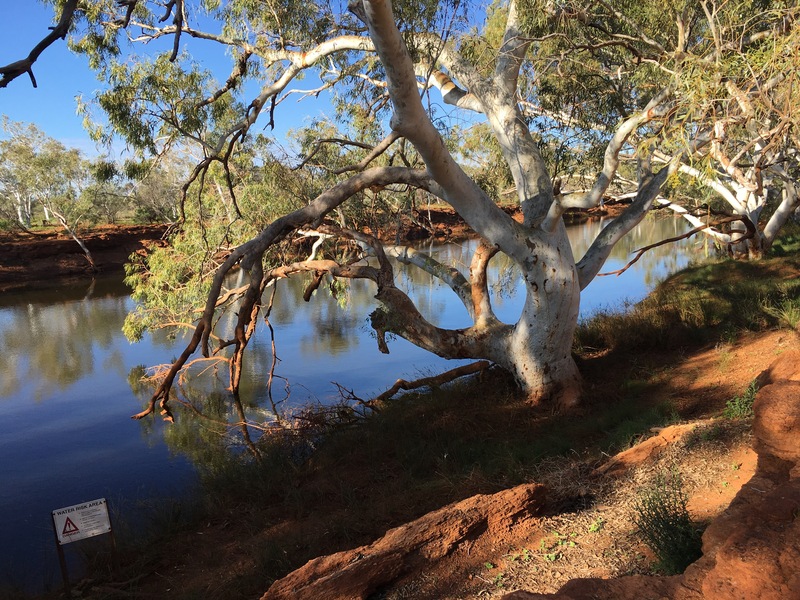 On the way back to the tourist park we stopped at Cattle Pool for a look – it was a picturesque little watering hole that reminded me a little of camping along the Murray River with its gum trees, here they were thick with white healthy trunks, lining the banks. I thought we should get back to camp to sign back in and let reception know that we made it back safely from the summit. We sat in the van and had a nice hot cuppa before driving out to view the sunset over the ‘rock’. The colours were supposed to change in a similar fashion to Uluru as the sun went down. I’m not sure the colours were as dramatic the day we were there but it certainly was a pretty sight to see before driving back at dusk to enjoy a nice hot meal before bed. Two big days and another big driving day ahead of us – I was absolutely knackered. We were a bit slow off the mark leaving Mt. Augustus, we woke up with the realisation that it was the 1st of August and we were going to be home by the end of the month so we didn’t leave until nearly 10am. 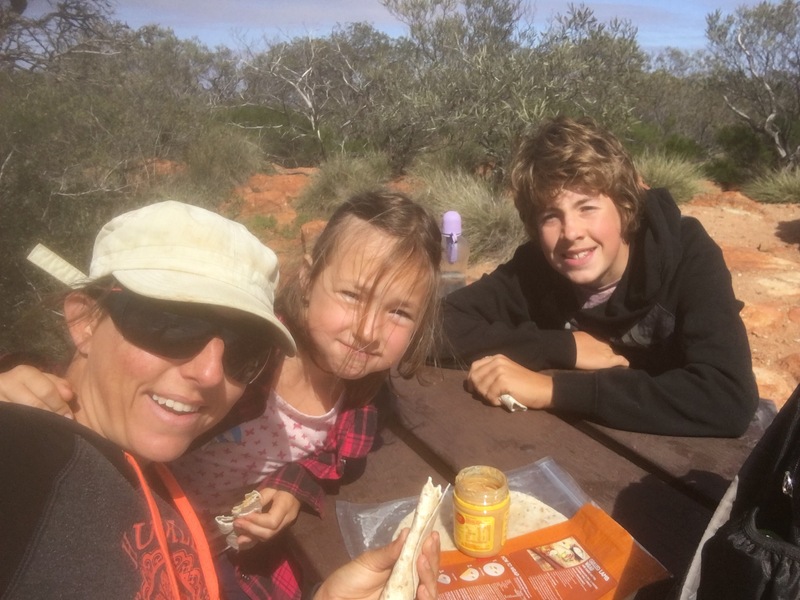 On the way back to Carnarvon, we stopped again for fuel at Gascoyne Junction and decided to grab some lunch while we were there. I asked the guy at the counter what they had on the menu and he read a few things out to us but didn’t show us any sort of menu so we just ordered based on what he’d said. I got the $120 bill and paid it thinking ‘that’s a bit steep’ then went to the car to move it to a better carpark. It was going back to the car that I realised the fuel only came to $45 – lunch just cost me nearly $80!! Again, I was swindled into spending in my exhaustion delirium – I need to hide my credit card when I’m tired – I’m worse than a drunk doing late night shopping online when I’m tired! We got to Carnarvon in the late afternoon and set up the van at the caravan park thinking that we’d sit outside as it was a nice evening. Apparently all of the mozzies thought it was a nice night too so we soon retreated to indoors and stayed there til morning. I think we were all tired as we went to bed early and slept well all night. In the morning we packed up pretty quickly as we’d not set up too much the day before and headed in to town to check out One Mile Jetty. I hadn’t brought my purse from the car and didn’t realise you needed to pay to walk the pier so we just admired it from the end and then got into the car and started the drive to Denham with hopes of Dolphins and seaside sunsets.